Ananka's Diary: Another Installment of "What IS It?" Another Installment of "What IS It?" 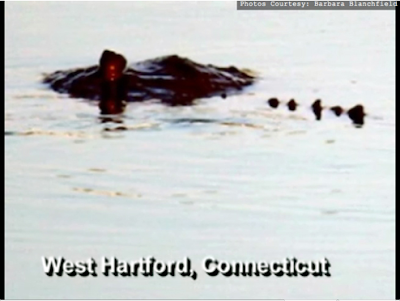 A large creature was recently spotted taking a dip in the scenic West Hartford reservoir. What the heck was it? Alligator? Gigantic mutant toad? Baby Godzilla? in one of the pics it looks like a peice of seaweed or something like that. I have NO CLUE what the heck that is. Maybe A baby godzilla? It looks like a cross between a hippopotomus and a stegosaurus. Or maybe Nessie got herself teleported. i agree with writtenchaos. it's a cross between a hippo and an alligator.